An Emirates airliner carrying more than 225 people had to make an emergency landing after its tail struck the runway as it took off in Australia. 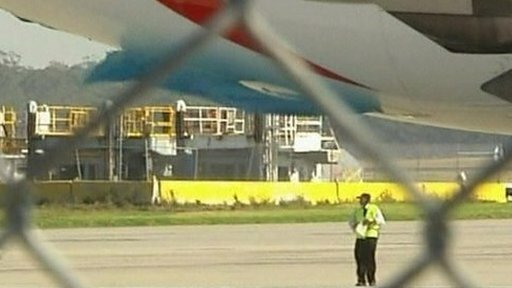 Flight EK407, headed for Dubai, circled the airport at Melbourne to dump fuel for about 45 minutes before landing without any injuries to passengers. The accident sent smoke into the A340's cabin and reportedly left debris on the runway, knocking out some lights. One passenger told the Australian Broadcasting Corp: "It was terrifying." "I'd hate to go through it again," Catherine Edmunds added. Dubai-based Emirates said in a statement it would conduct an investigation into Friday night's incident. A spokesman for Melbourne airport told AFP news agency: "It took off very steeply, the tail touched the end of the runway, and it [the plane] went up, stabilised and came back." Australian Transport Safety Bureau spokesman Ian Brokenshire said several factors could cause a "tail hit" including weather conditions, loading issues and handling. Passengers and crew were provided with hotel accommodation and alternative travel arrangements on the next available flights.